Several years ago conspicuous black-and-white banners and yard signs began to appear in my rural neighborhood in Wisconsin. Planted in lawns, posted on barns, displayed in tavern windows, they read: SAVE The Rare White Deer. Since the late 1990s, when an adult white female—“Old Doe,” she came to be called—appeared in the fields and woodlots, our landscape has supported a small population of white white-tailed deer. As Old Doe passed her genes along, the population grew to a dozen or so. The genetic basis of this rare trait is not entirely clear. A few of the deer may be true albinos. Most are piebald variants, some pure white, others off-white or spotted. Some have pink noses and hoofs, others have black. In any case, the white deer are obviously distinguishable from their mostly brown comrades. They became known and admired in the local community and among visitors to the nearby state park. A tacit agreement to protect the unusual deer took hold among the area’s farmers, other landowners, and local hunters and non-hunters alike. This spontaneous taboo was somewhat surprising and mysterious. The culture of white-tailed deer hunting in Wisconsin (and the US generally) has long involved a complex mixture of memory and reverence, passion and practicality. In Wisconsin the whitetail’s forest, woodland, and savanna habitats shrank rapidly in the 1800s as settlers arrived from the eastern and southern US and from Europe. In just a few decades, agriculture and lumbering transformed landscapes and ecological conditions throughout the upper Mississippi River and Great Lakes basins. Market and subsistence hunting compounded the pressures on the deer population, and the species came close to being extirpated. With the adoption of new wildlife conservation measures in the 1930s, however, the deer population started to rebound. As deer became more common, the annual autumn hunt became an engrained institution and a seasonal mainstay of rural economies. Over the last several decades deer have become familiar residents of suburban and urban landscapes. With large predators extirpated or uncommon, the now abundant deer foster their own suite of ecological effects. Their herbivory has diminished the diversity of native flora. They chew up suburban shrubs and gardens. They contribute to the high incidence of Lyme disease. They find themselves on the receiving end of automobile collisions (which has led insurance companies to become active in deer management policy). Through all these changes, humans became the primary predators of deer. Paradoxically, deer hunting in Wisconsin can be both unsentimental—a standard cultural practice, a source of locally grown meat, a necessary conservation method—and deeply personal. Hundreds of thousands of deer hunters take to the fields and woods every fall in Wisconsin, bearing with them a complex set of values, memories, motivations, and goals. All of which complicates questions surrounding the hunting of the white deer—and explanations of the neighborhood taboo. Hunting white deer is actually illegal in Wisconsin, as it is in a number of other states in the US. This population, however, happens to exist in an area where chronic wasting disease (CWD) has become prevalent. When hunting regulations were liberalized in an effort to halt the spread of CWD, the white deer became—literally—fair game. A decade ago a striking white buck become a popular attraction. “He was a beautiful creature,” the deer advocates’ website noted, “that drew many people nightly to the park with their lawn chairs and thermoses in hopes of seeing him.” Local hunters vowed not to pursue it. However, after two years in the local spotlight, the buck was taken by a visiting bow hunter in 2008. An out-of-town hunter shot another white deer during the 2009 season. On the first day of the 2012 gun season, a visiting hunter took down a particularly large, handsome, and well known buck. It was that incident that prompted local residents to step up protection efforts. As the signs appeared, conversations on the propriety of hunting the white deer intensified in our taverns and back yards, in newspapers and at meetings, among and between hunters and non-hunters alike. Why have so many of my neighbors felt so compelled to protect these “ghost deer”? Is it their value in terms of biodiversity conservation? Hard to argue that. They are not a separate species, and any intra-species variance they embody is unlikely to be lost; the recessive genes for albinism and pale pelage will surely persist in the population. If anything, the white deer (like the abundant deer throughout our region) have a variety of direct and indirect effects on tree reproduction and the diversity of understory plant communities. Perhaps, as the signs suggest, the rarity of white deer is the key. We do not put up banners to protect brown deer, and if all deer were white would we be so concerned? 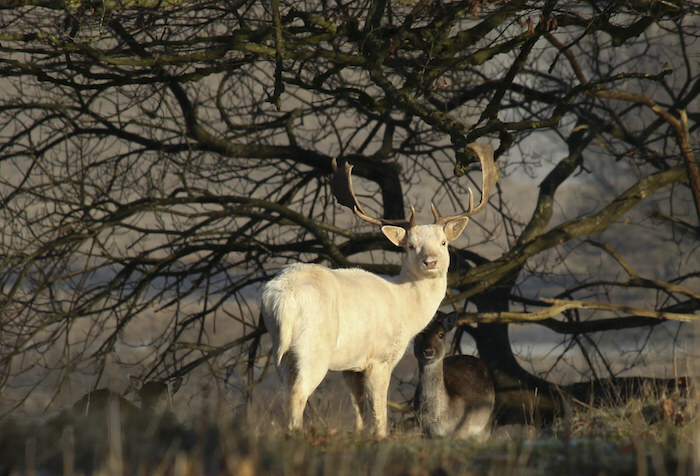 Conspicuous as they are, white deer likely have a harder time surviving in the wild; perhaps their vulnerability evokes in us a protective instinct. Is it a matter of resentment of outsider hunters who come only to consume what is locally familiar and valued? Is it the evident beauty of the deer? If so, do not both hunters and protectors of the white deer have a claim to such beauty, however different their apprehension of it? Perhaps my neighbors are tapping into a deeper and culturally widespread respect for the sacred white animal. In several Native American traditions, the extraordinary appearance of a white bison is a spiritual event. A white elephant came to Queen Māyā in a dream; as she was conceiving the child who would become the Lord Buddha, the elephant gifted her with a white lotus flower. White stags led Arthurian knights into battles. “On the wings of a snow-white dove,” the old country song goes, “He sends His pure sweet love.” We humans seem to follow wild white animals into the presence of many mysteries. Ahab’s neurosis sits uneasily alongside the view that sees hunting as a primary agent of human biological and cultural evolution. In The Hunting Hypothesis (1976), paleoanthropologist Robert Ardrey marshalled evidence that the human species evolved with and through the practice of hunting. Controversial among scholars and scientists when first published, the book would not have made great ripples among old-school sportsmen-conservationists (think Theodore Roosevelt) who emphasized the values that hunting could inculcate, nor in indigenous communities and cultures with venerable hunting traditions. Whether building upon traditional ecological knowledge or modern conservation ethics, the thesis that hunting has made us human—evolutionarily, physiologically, intellectually, socially, culturally, spiritually—has gained acceptance. 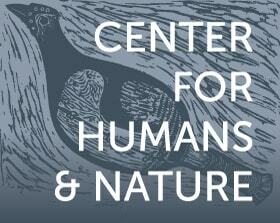 As the scientific debate has continued, evidence has grown that hunting shaped our humanity. Maybe, however, we need to add “Ahab’s Corollary” (or Caution) to the hunting hypothesis: that hunting alone has not made us human, and that hunting in an age of all-powerful technology does not necessarily make us human. Hunting is not the only type of human-animal relationship that has molded our humanity. Humans also protect animals. Through taboos, ethical codes, and regulations, people have chosen not to hunt—not to hunt certain species, not to hunt at certain times and in certain places, not to hunt to excess. We also domesticate animals, breed them, move them around, buy and sell them, industrialize them, consume them, abuse them, rehabilitate them. We name animals, tell stories about them, sing songs about them, name teams after them. We invoke animals, honor them, celebrate them, paint them on cave walls, and share viral videos of them. In all of these ways animals—not just hunting per se—have made us human. Animals teach us, through our every interaction and our every choice, what we value and honor, what we seek and what we ignore. Animals instruct us on who we are, and who we wish to become. They reflect and demonstrate our sense of responsibility—and our lack thereof. In choosing to protect the white deer, my neighbors, including many hunters, have expressed different dimensions of their evolving humanity. Game animals, moreover, are only one part of the more-than-human world that makes us human. We hunt only a miniscule subset of animal species; the vast realm of “non-game” species, from protozoans and invertebrates to the great whales and great apes, also make us human. The multitudinous and diverse microbes in our guts make us human. The rumored remnant of ivory-billed woodpeckers makes us, in our hopes and doubts, human. Even absent animals makes us human. The extinct Pleistocene megafauna and the vanquished passenger pigeon, in our longing and regret, make us human. Mythical beasts—Bigfoot and Windigo and Phoenix, Nessie and Mickey and Lassie—make us human. Plants also make us human. Rocks and soils and waters and climate and fire make us human. The stars and the sun make us human. Through all our complex ecological and evolutionary relationships, human consciousness has emerged and grown and evolved. Nature makes us human. The more-than-human makes us human. This last season’s hunt passed without any of the local white deer taken. It is impossible to know what was going on, out there in the woods, in all the minds and hearts of hunters who might have encountered one of the specters. But in the very act of weighing options as we encounters Others, we forge our humanity. These white deer remind us that the hunter and the hunted create each other through their relationship. Human hunters have the power of active agency and conscious choice. In the shared territory of the white deer, most (if not all) local hunters have chosen not to hunt them. Other hunters, coming into that territory, have chosen to do so. The question is: what do we bring to these choices? This is what the American ecologist and conservationist Aldo Leopold was getting at in contemplating the extinction of the passenger pigeon: “For one species to mourn the death of another is a new thing under the sun. The Cro-Magnon who slew the last mammoth thought only of steaks. The sportsman who shot the last pigeon thought only of his prowess. The sailor who clubbed the last auk thought of nothing at all.” Leopold, a hunter, understood Ahab’s Corollary. Hunting makes us human; but hunting without a continually evolving ethic to guide it can also dehumanize us. Our humanity can and does suffer when the practice of hunting—when any of our acts of using nature—ignores connections and disrespects the non-human. Our humanity flourishes when those acts honor, enrich, and sustain these vital relationships. In such moments, through such encounters, we continue to define the hunt—and our own humanity—in new ways.